Princess Cruises offers a variety of Tahiti Cruise tour packages. A Tahiti Cruise tour allows you more time on the islands of French Polynesia before or after your cruise. Ever dream of staying in an Overwater Bungalow? Now's your chance! Princess Cruises offers packages that include stays on Bora Bora, Moorea and/or Tahiti. Indulge with two, three or four nights. Scroll down to view all that's offered. No name captures the imagination of paradise as well as the French Polynesian island nation of Bora Bora. Majestic mountains sculpted by ancient volcanoes, a shimmering lagoon and a barrier reef dotted with tiny motu or islets welcome visitors to perhaps the most stunning island in the South Pacific, and generations of travelers - including novelist James Michener - regarded Bora Bora as an earthly paradise. Approximately, a mere 4,600 people live a seemingly idyllic lifestyle in the main villages of Vaitape, Anau and Faanui. Vaitape - Among the sights of this quaint village is the tomb of French navigator Alain Gerbault, who circumnavigated the globe solo during 1920. Maraes - Ruins of ancient Polynesian open-air temples are found throughout the Farepiti, Faanui and Anau districts. World War II Relics - Bora Bora was a U.S. supply base during World War II; naval gun sites can still be seen. 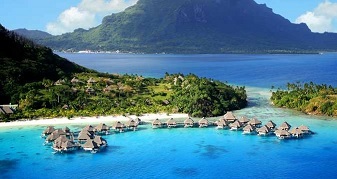 Bora Bora & Tahiti Cruise tours #3 and #4 include a 4 night land tour package. You'll enjoy 3 nights at the Hilton Bora Bora Nui Resort in an Overwater Villa plus 1 night at the InterContinental Resort Tahiti. French Polynesia is made up of some 130 islands, of which Tahiti is the best known. Just 12 miles across the lagoon from Tahiti lies Moorea. To discover the Polynesia of Melville, Gauguin and Michener, you must visit Moorea. This former haunt of Tahitian royalty is a place where you will still see fishermen paddling outrigger canoes, pareo-clad women strolling along the roads and children fishing from island bridges. It is an island of steep vertiginous mountains where most of its 14,000 people live along the narrow coastal shelf, with a backdrop of lush green mountains rushing upwards to fill the sky. Afareaitu - Enjoy the white-sand beaches and acquaint yourself with the friendly residents of Moorea's main community. Papetoai - This north shore village boasts the oldest European building, an octagonal church, still in use in the South Pacific. Cook's and Opunohu Bays - These fjord-like bays give the island its distinctive butterfly shape. Moorea & Tahiti Cruise tours #2 and #5 include a 4 night land tour package. You'll enjoy 3 nights at the Hilton Moorea Lagoon Resort in an Overwater Bungalow plus 1 night at the InterContinental Resort Tahiti. Immortalized by Gauguin's paintings, Tahiti is much more than an island; it's a state of mind. Papeete, capital of Tahiti, is the chief port and trading center. It's also a provocateur luring people to her shores. Today the island is a charming blend of Polynesian "joie de vivre" and Gallic sophistication. But venture out from Papeete, and you'll find a landscape of rugged mountains, lush rain forests, cascading waterfalls and deserted beaches. Tahara Hill and Matavai Bay - The perfect viewpoint of the bay where Lt. William Bligh's HMS Bounty anchored in the novel, "Mutiny on the Bounty." Point Venus - This lighthouse now stands where James Cook and the scientists of his expedition observed the Transit of Venus in 1769. Gauguin Museum - This museum chronicles the French artist's life in Polynesia and includes two sketches and a sculpture. Tahiti Cruise tours #1 and #6 include 2 nights on the island of Tahiti. 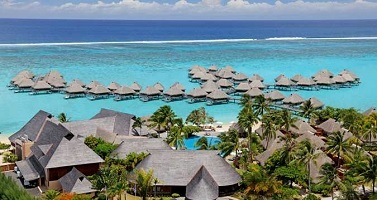 You'll enjoy 2 nights at the InterContinental Resort Tahiti in your choice of accommodations. This cruisetour gives you plenty of time to relax and soak in the sun or explore the island.